It’s been another bad week for America’s benighted patent system: a Texas jury ordered Samsung to pay a patent troll $16 million for using Bluetooth — even though the “inventor” admitted Bluetooth had been on the market for years before he patented it. The system is a mockery. Still, its defenders say, the system is working because it facilitates “tech transfer” and the passing of critical knowledge from inventors to companies. But now even that justification is collapsing in light of a new study that suggests patent licensing often does nothing at all to promote research or new products. 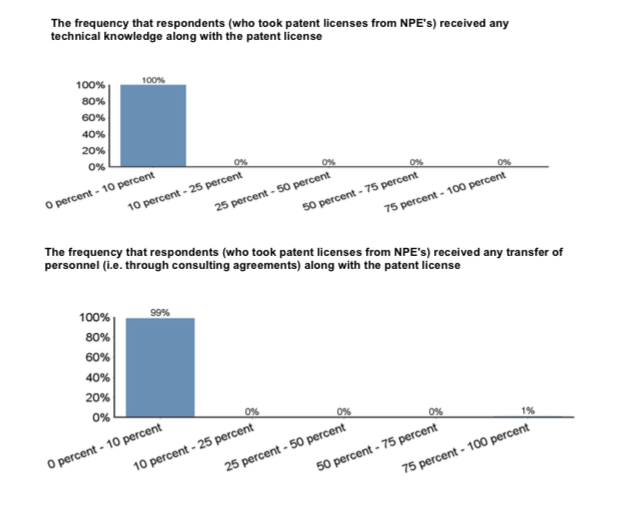 The study, titled “Does Patent Licensing Promote Innovation?,” is by Mark Lemley of Stanford and Robin Feldman of UC Hastings, and is based on a survey of 188 people whose job involves negotiating patent licenses at major companies and elsewhere. In other words, those who paid patent trolls (which are responsible for the lion’s share of legal activity around patents these days) for a license say they received virtually zero benefit from doing so. The paper also notes that the same phenomenon, in which licensees pay money for nothing, is also pervasive when universities are the ones wielding the patents. Instead, as with the trolls, university patent deals rarely lead to meaningful tech transfer or innovation. The findings could have important implications at a time when more universities, including MIT and Boston University, are using decades-old patents to demand money from Apple and other big companies. While the study doesn’t offer specific prescriptions for reform, it does repeatedly raise the fact that many of the (apparently useless) patents at issue are being asserted at the end of their life-cycle. This points to a solution in the form of shorter patent terms or, as Professor Brian Love has suggested, the President could order the Patent Office to change its fee structure so as to discourage trolls from hoarding patents on obsolete technologies. The paper notes that its sample size is small, and that more study is needed, but the survey could still gain attention in light of the provenance of the authors. Feldman has been instrumental in revealing the massive trolling operation, involving hundreds of shell companies, carried out by Intellectual Ventures, the standard bearer for the patent trolling business. Lemley, meanwhile, is one the country’s most prominent antitrust and intellectual property scholars, whose work has shown how patents and innovation are not one and the same, and that many of the conventional justifications for awarding patent monopolies are false. The study also comes at a time when Congress is trying for a third time to pass a bipartisan bill to reform the patent system. All wealth in our modern society now resides in patents, copyrights, trademarks, and other kinds of property rights. The wealthy elite control the vast majority of them and will fight to prolong their monopoly until their last dying breath. The only difference between a billionaire and a poor person is a few pieces of paper with some information written on them that describes how to construct a cutting edge tool. Or a piece of paper that says “I got lucky and thought of this first and had lawyer money to back it up so I get a monopoly on the idea for the next 20+ years, hahahaha”. Apple isn’t a technology innovator anymore. They are a predator legal entity innovator. Bill Gates’ entire fortune was predicated on these very practices. It’s funny that the “system is a mockery” and “benighted” if a large company (in this case, Samsung) is found by a jury to have infringed a patent, yet I’m certain Mr. Roberts would have applauded a finding of non-infringement/invalidity in this very same Texas case. It appears that Mr. Roberts lacks faith in the jury system and believes that he, somehow, is more qualified than jurors to pass judgment in a given patent case. This article states that “those who paid patent trolls for a license say they received virtually zero benefit from doing so.” This statement is nonsensical. Why would any company accused of infringement that is required to pay for a license admit to using the technology that it is accused of infringing? The “benefit” was already obtained by the company by using the technology without a license to the patent. Of course such a company is not going to say it receives a benefit once it has to pay for using such technology. Further, Mr. Roberts’ comment/request to “point us to some (legitimate) research to show the system is working” is frightening, particularly from someone who claims to understand patent law. There is a plethora of information that demonstrates how the patent system is “working.” Mr. Roberts should spend some more time researching and investigating before publishing this one-sided drivel. The whole point of a jury is that they’re not supposed to be qualified. They’re your average Joes and Janes who don’t even know if you can eat a patent or not. I’m about to give up on reading GigaOM ever again. Why do you persist in one-sided, subjective coverage of this issue? This report is ludicrous. It’s like polling a prison asking inmates if they’re guilty or not guilty. What do you think the results would be? There shouldn’t be results showing a tech transfer because, in most cases, the infringing party has already stolen and is practicing the patented technology or method. What part of that is hard to grasp? Of course there are some ludicrous patent trolls/lawsuits but you continually paint a picture that big tech company = good and small company/inventor = bad. My issue with the report is that it fundamentally misses the issue of a patent. A patent acts as a blueprint outlining your invention…you receive the patent to open up your method to the public to promote innovation. What has been happening is that larger companies use this blueprint to replicate tech or methods on their own…which in turn leads to infringement claims. Unfortunately, I have had to experience this first hand with larger companies taking meetings with us, asking about our tech, reviewing our patent (and even pending patents) and then going silent. It’s usually 6-12 months later and we see the same companies offering replicated technology in the market. So, the same Innovation Act you continue to promote as a good thing, is the same thing that would put both startups and inventors out of business. I don’t know where the narrative suddenly developed that large tech companies have a positive moral compass and are now ‘victims’ here. These are the same companies that have been using tax avoidance strategies for years that creates an even more uneven playing field with smaller companies. And now they are trying perhaps the largest property grab in history – devaluing IP to the point that IP is only valuable to the largest players with deep pocketbooks. As for the ‘system’ working, the AIA and Alice decision are already having an affect on trolls. So why is there this continued rush to push forward the Innovation Act until the already positive results of both of these events can fully take hold?